Warwick Rotary Club, led by President-elect Jackie Crampton, took up the challenge to help show the public many of the activities that take place within the local community by volunteers and voluntary organisations, and it all formed part of the national Museums at Night campaign. The exhibition took place in Warwick Market Place and surrounding streets, as well as in the museum itself, and featured over 50 stalls, as well as other entertaining groups and was held on Friday May 16th. Running from 3pm, when it was opened by the Mayor of Warwick, it ran through till 10pm and was blessed with very good weather. It was well attended and was so popular that there were many requests for it to become an annual attraction for the town. It was not restricted to Warwick itself and there were displays from organisations throughout the county. 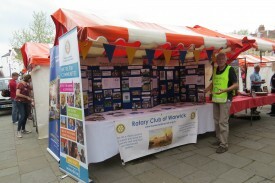 The picture below shows the stall of Warwick Rotary Club which was visited by many people during the course of the day and we were able to demonstrate not only our activities but also where we have been able to provide assistance in the community and round the world and how the money that we have raised has been spent.